A weekend-long training initiative launched by UK-based organisation, Visiting Arts came to a close yesterday. Culture Division is a part of the Culture Works Connections programme which seeks to build stronger, more sustainable creative businesses that are able to access world markets and develop collaborations. Culture Works Connections programme initiative is funded by the ACP Cultures+ ACP-EU Support Programme to ACP Cultural Sectors, financed by the European Union and implemented by the ACP Group of States, and aims to build a community and lasting network of creative businesses in more than fifteen countries in the Pacific, the Caribbean and Africa over three years from 2014-2017. One of the overarching programme aims is to help participants overcome one of the major barriers to international working, which is the need for good accessible information on what exists and how to reach it. 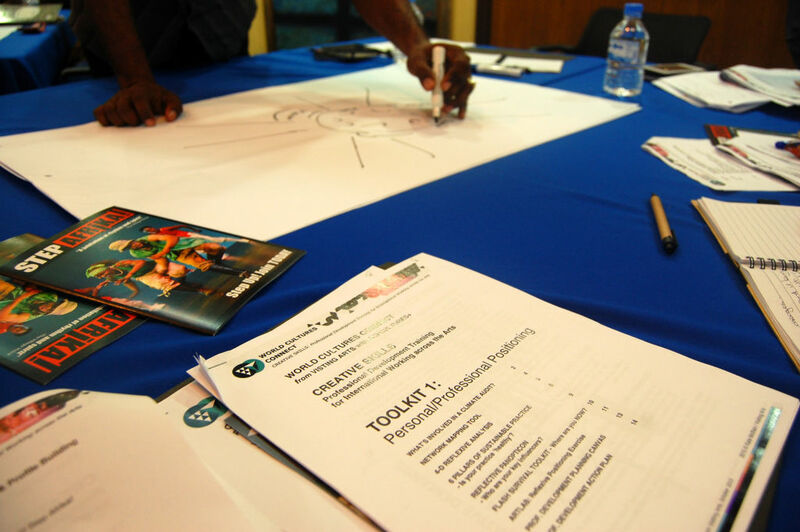 Other project partners are The Africa Centre, South Africa and The Pacific Arts and Culture Foundation in Fiji. 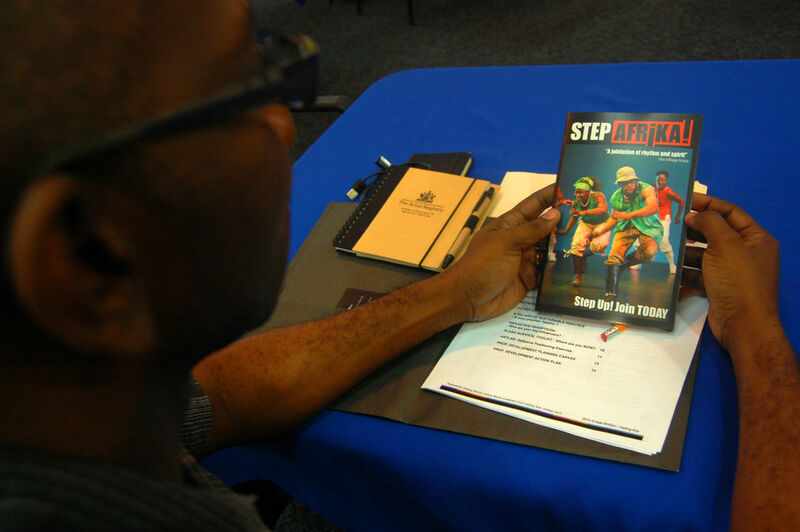 Trinidad and Tobago is the launch pad for these workshops as it is the very first stop for the facilitating team. The next workshops will be held in Ethiopia and Malawi in November 2015. The first part of a targeted workshop training package and suite of training modules, developed by Visiting Arts Training Consultant, Kate McBain, was delivered to a mixed group of creative practitioners across a range of cultural and creative disciplines. C. Brian Williams, Founder and Executive Director of Step Afrika! based in Washington, DC, brought his experience of over 20 years to the weekend’s interactive learning. Participants were selected from a pool of applicants after a Call for Applicants was issued on the 23rd September, 2015. 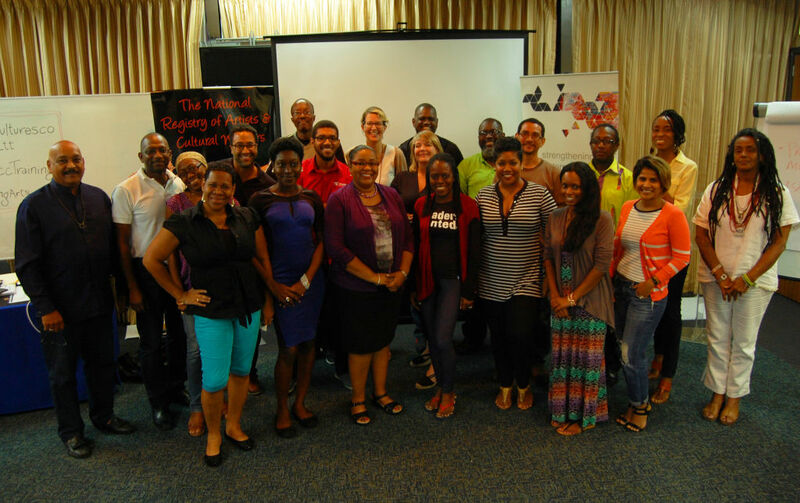 The participants and facilitators of the Visiting Arts Workshop, Trinidad pause to take a group picture at the close of the 3-day Training Intensive. While covering topics such as Building Audiences, Routes to Market, International Funding Resources and Trends for the Creative Sector, Project Building and Mapping, The Pros and Cons of Hiring Support Services and Developing a Successful Online Presence, the facilitators incorporated peer learning and collaborative working strategies into the lessons. A series of virtual presentations and surgery sessions with experts spread out over several months to support participants’ self-directed learning and strategic planning forms Part Two of the training. The response to the Call for Applicants was so positive that the facilitators opted to host a separate session on Monday 19th October, 2015 for the benefit of a small group of applicants who would find value in a short, introductory session on the broader topics of the weekend’s session. Still to come is a panel and round-table discussion which will take place tomorrow, Tuesday 20th October. The focus of discussions will be key strategies for developing international work and collaborative practice across the Creative and Cultural Industries and in particular exploration of routes toward international work for Trinidad and Tobago’s creative professionals. While this is a closed event, the discussions will be shared with the wider public at a later date. Feedback from the participants noted that this was is a beneficial partnership and initiative. What was most appreciated was how interactive the presentation of the material is which allowed for thorough coverage of the broad topics. Culture Division is pleased to be a partner in this initiative through the Artist Registry. Culture Division -Ministry of Community Development Culture and the Arts > Artist Registry > Visiting Arts Workshop Facilitators capture the attention of local Creatives.